Physiotherapy is by appointment only. X-ray opens at 8.15am - 4.15pm. If you can avoid their busiest times, 10.30am - 2pm, you are likely to be seen quicker. BrisDoc GP out of hours is open from 6.30pm - 8am Monday to Friday and 24 hour care during the weekend. There are wheelchairs available for use. Please ask at the main reception. From the M4 motorway, exit at junction 19 and take the M32 towards Bristol. Take the second exit, junction 2, signposted Fishponds/Eastville. At the roundabout, bear left and follow Fishponds Road. At the second set of traffic lights turn right into Lodge Causeway. Go over the railway bridge and straight on at the first set of traffic lights. At the next set of traffic lights, carry straight on up the hill, bearing sharp right. The hospital entrance is on the right hand side. A4 London Road, take the first exit off the roundabout on to the A46 (slip road). Follow the A46 and take the first available exit off the roundabout on to the A420 (London Road). At the mini roundabout turn left on to the A420 (London Road). Take second available exit off roundabout on to A420 Deanery Road and then turn left onto A470 Hanham Road. Turn right on to the A470 Cecil Road. Take fourth available exit on to A420 Two Mile Hill Road. Take second available right on to A4017 Soundwell Road and follow B4048 Lodge Road. There are 54 pay and display car parking spaces plus an additional 11 disabled and 11 renal disabled spaces. Car parking charges apply 24 hours a day, 365 days a year. Disabled drivers displaying a blue badge park free of charge. If there aren't any disabled bays available, you can park in any public car park space free of charge as long as you display your blue badge. Blue badge holders are not permitted to park on double yellow lines anywhere throughout the site. 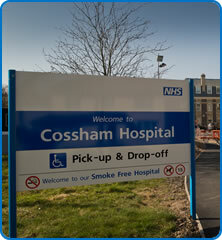 Visitors and patients visiting the hospital are requested to respect the local neighbours if parking in adjacent streets. Please consider using alternative forms of transport, such as bus services which stop outside the hospital.